Two years after a kidney transplant, I have foamy urine and legs are swollen. Please help. iCliniq › Ask a doctor online › Answers › Internal Medicine › Kidney Disorders › Two years after a kidney transplant, I have foamy urine and legs are swollen. Please help. Q. Two years after a kidney transplant, I have foamy urine and legs are swollen. Please help. Two years back, I had a kidney transplant. Now, I have swelling in legs and foamy urine. I take Prograf 3 mg in the morning and 2.5 mg at night. My BP is 102/55 mmHg. I do not have diabetes. Please help. • From the reports, can you please tell me the reason for my mom's swollen feet? • Two years after a kidney transplant, I have foamy urine and legs are swollen. Please help. I have reviewed your health query and it seems your kidneys are not functioning optimally. There is some ongoing disease process that has caused deranged kidney function. Swelling in legs (edema) and foamy urines are symptoms and signs of deranged kidney functions. 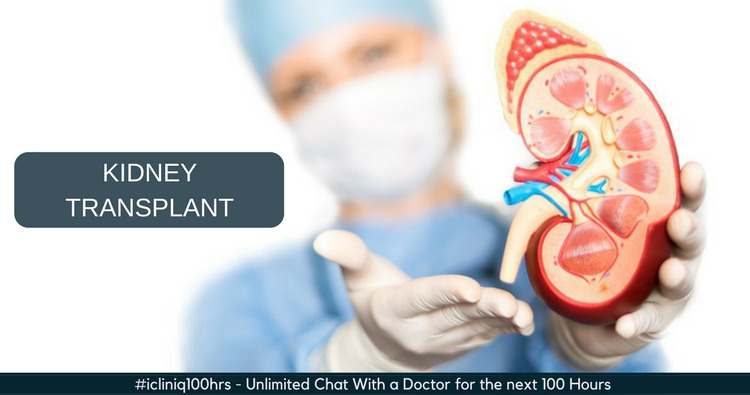 It warrants a quick visit to a nephrologist or urologist or your treating physician for thorough evaluation and management. Your medications seem good. But if there is some infection or other reason found on investigations, your kidney doctor may add some medications accordingly. Hope it helps. Please feel free to ask more queries if you need further assistance. I would be happy to answer. Regards. Why the bilirubin level is elevated consistently since three months? Kindly explain the test results of my father.